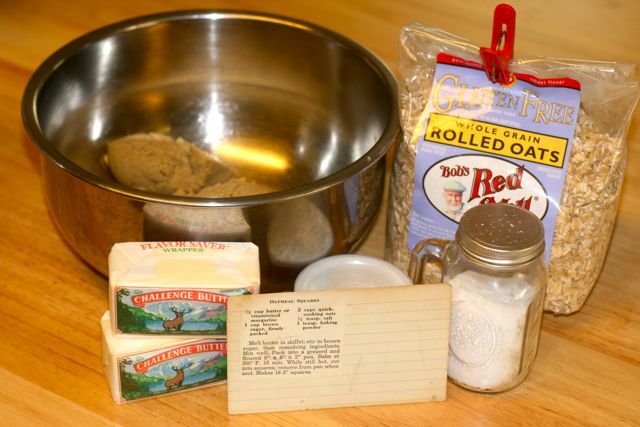 Gram had some fantastic cookie recipes and I’ll finish cookie week with one of my favorites. 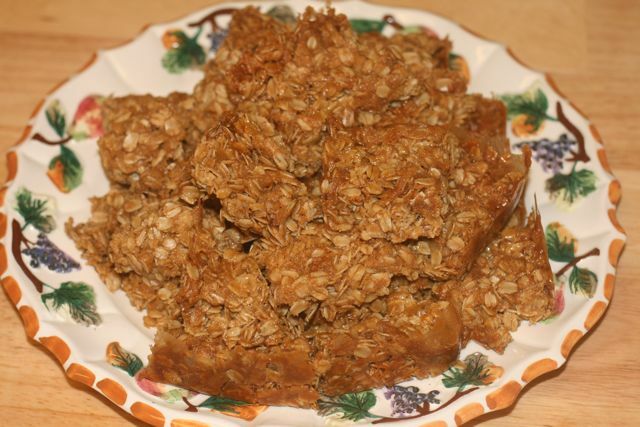 Not only are Oatmeal Squares ridiculously easy to make, with barely any effort they can be made gluten free for those who need it. A colleague of mine has Celiac Disease and I make these with certified gluten free oats from Bob’s Red Mill. Seems like when a person gives up certain foods for their health, they have to give up flavor and enjoyment, but like I said, with a little effort, those with gluten concerns can make these and enjoy! Substitute certified gluten free oats 1:1. Melt butter in skillet; stir in brown sugar, then remaining ingredients. Mix well. Pack into greased & floured 8x8x2 pan. Bake at 350 for 15 minutes. 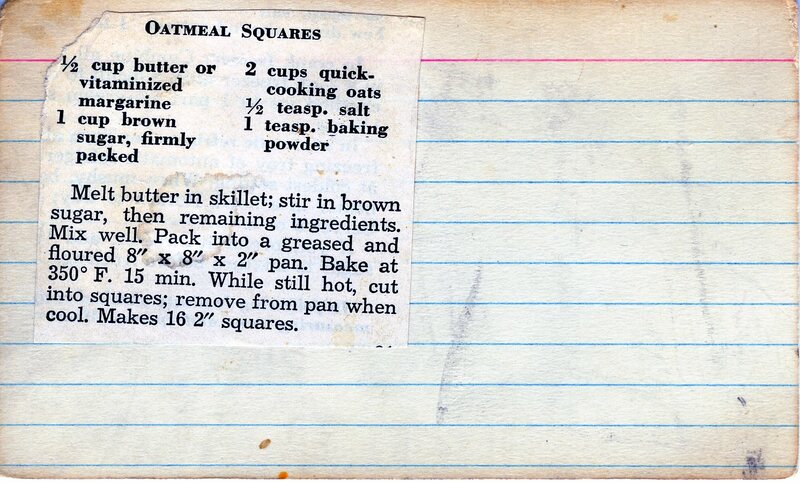 While still hot cut into squares; remove from pan when fully cool. Makes 16 2″ squares. 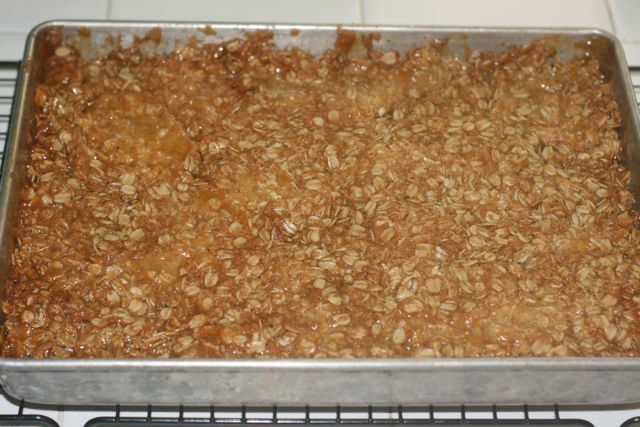 Since tomorrow is my friend’s birthday, I made a batch of oatmeal squares to take her. I made a double recipe because we will have to share with the others in our office. One thing I like to tell people when I give out this recipe is that when you mix the butter and brown sugar together, stir it well and until the sugar is fairly dissolved, but not so long that it turns to caramel. Also, the recipe says to cut these while they are hot. If you try to cut them right out of the oven, they are very soft and mushy. Wait about 10 minutes and then cut them, as your cuts will be more precise and won’t mush up the rest of the cookies. I hope you will try them and enjoy! They are very simple to make but so delicious. They are a favorite at my home and my office.